More proof of the Medieval Warm Period from midges | Watts Up With That? As I’ve pointed out on WUWT several times, the study is terribly flawed, because they haven’t considered other possible factors, such as DDT and other pesticides being transported into the lake from nearby military outposts and settlements, plus the tendency for transport or organotoxins into glacial ice which ends up in meltwater lakes. Plus the nearby weather station shows no significant warming. A similar sort of reconstruction was done in alpine lakes of the Alps with similar results. 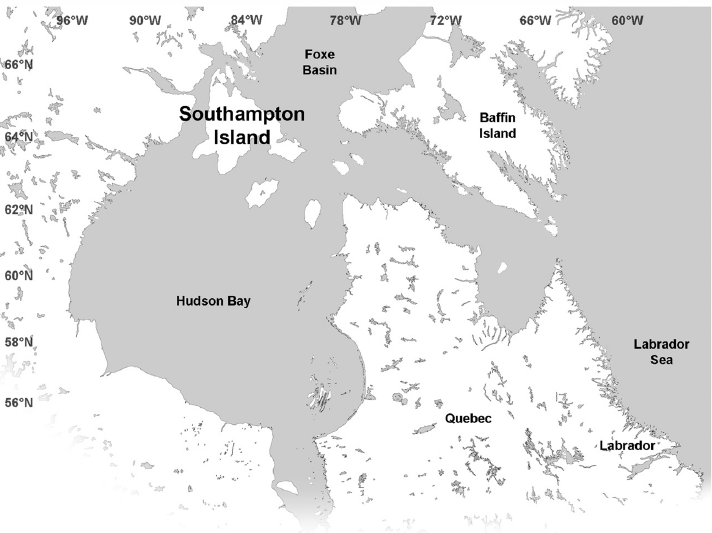 This study presents the Late-Holocene evolution of a northern Southampton Island (Nunavut, Canada) lake, using fossil chironomids supported by sedimentological evidences (XRF, grain size and CNS). All proxies revealed a relatively stable environment during the last millennium with short-lived events driving changes in the entire lake ecosystem. The chironomid-based paleotemperatures revealed variations of significant amplitude coincident with changes in the sediment density and chemical composition of the core. Higher temperature intervals were generally correlated to lower sediment density with higher chironomid concentration and diversity. Higher temperatures were recorded from cal yr AD 1160 to AD 1360, which may correspond to the Medieval Warm Period. 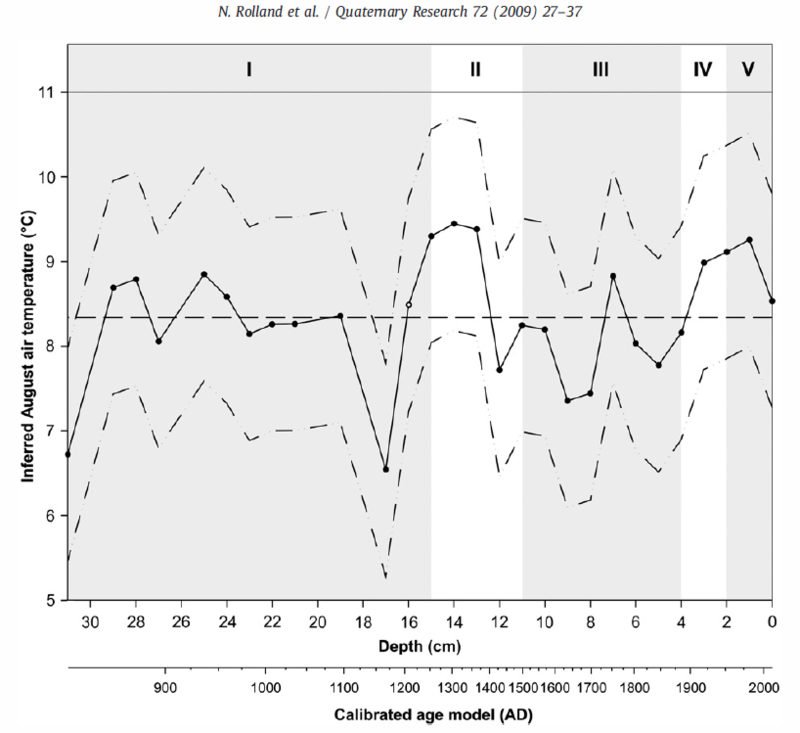 Between cal yr AD 1360 and AD 1700, lower temperatures were probably related to a Little Ice Age event. This study presents new information on the timing of known climatic events which will refine our knowledge of the paleoclimate and climatic models of the Foxe Basin region. It also provides a new framework for the evolution of such freshwater ecosystems under the “Anthropocene” and underlines the importance of including sedimentological proxies when interpreting chironomid remains as this combined approach provides an extended overview of the past hydrological and geochemical changes and their impacts on lake biota. The entire paper is available online here (PDF). October 21, 2009 in Paleoclimatology. Does that junk study really deserve so many rebuttals? Any junk study that gets MSM attention needs rebuttal. I haven’t seen any press treatment of the studies that show no AGW, they may be out there, but not evident. At what point does this series of stories qualify as “kicking a dead midge”? Impressive accuracy, showing all climatic epochs. To download the PDF inmediately. The use of biological sedimentation proxies, while confirming the existence of a MWP in the Western hemisphere, seem to indicate a substantially shorter warm period – 1160 is a very late date for the onset of this phase, compared with MWP dates in Europe, although the end of the warming appears to coincide with the European dates. What would this suggest for natural climate forcing mechanisms? 116 I think the first sentence of this story makes for much more factual reading if the commas are left out. I wonder how long it’ll be before they twig? . . . Yes, real science is Baffining (sic) to these climate loons most of the time. Interesting that we have only 22 cm of sediment in a thousand years. A strong MWP only brings the use of the term “unprecedented” into question. The crucial piece for re-establishing serious consideration of “How much of the warming is quantifiably anthropogenic anyway?” would involve showing that the Little Ice Age was strong, geographically pervasive, andor lengthy. In the Canadian Arctic the post-glacial warming moved from west to east. It is entirerly possible that a similar pattern held for the MWP. Remember, there are large ice sheets just to the east on Greenland. Correlate tree rings to midges? Brilliant. I know the answer is in that bit of scientific work. Below is a link to the Axford study abstract. The paper itself is behind a paywall. Paleoecological and geochemical data indicate that the past three interglacial periods were characterized by similar trajectories in temperature, lake biology, and lakewater pH, all of which tracked orbitally-driven solar insolation. In recent decades, however, the study site has deviated from this recurring natural pattern and has entered an environmental regime that is unique within the past 200 millennia. The tracking of orbitally-driven solar insolation by climate indicators is the significant finding of the study. This finding predictably was omitted from the press release. Can’t have the masses thinking the orbit of the sun drives the Earth’s climate. The last sentence contains no specifics of what deviations were found, which is unacceptable in a scientific abstract. And without access to the paper I can’t comment further. Except to say the last sentence sounds like the usual ritual affirmation of AGW tacked on to any paper that doesn’t find clear evidence of AGW. Germany records its coldest ALL TIME October temperature EVER. A balmy Negative 12 Fahrenheit. If there was significant warming during the ‘MWP’ it would seem fair to expect Atmospheric methane levels to rise, due to warming wetlands. Clearly there was no rise. Your link has no information on the MWP and methane levels. The problem (of GHG warming) is exacerbated by our poor level of understanding of exactly how some factors, like land-use albedo (the reflectance of the land), operate and interact. I can reassure that our understanding of these factors has exactly zero effect on GHG warming. In addition, it is pure speculation that any or all these factors exacerbate GHG warming. Some or all may mitigate it. The link contains a graph of the last 1000 years of atmospheric methane levels. Warming wetlands release more methane, they are source for 20% of the current high levels of atmospheric methane. Seeing that this a quick response to warming, seems like there should be a similar methane rise during the MWP. Methane is OT for this thread, but I will answer your question. Secondly, methane levels derived from ice cores are problematic because it is difficult to explain the variation from biological sources alone, and release of methane hydrates for example is invoked as an explanation. See same link. Thirdly, if you rescaled the methane graph from your link, you would see there is a rise during the MWP. BTW, making statements like ‘Warming wetlands release more methane’ with the implication it comes from the link following when in fact the link says nothing like this, is not kosher. For the record your link says. However, wetland response to climate change predicted for the next century is highly uncertain. Proliferation of midges in the area may be a function of total marshy area (favoured by mosquitoe type insects). This is an area of instability in that respect due to postglacial uplift (after-effect of Laurentide ice sheet), hence land uplift above water line would considerably affect ecosystem processes in shallow water areas over an extended period of time. As I understand it the Thule Inuit replaced the Dorset inuit around a 1000 years ago in the Canadian Arctic during a warm period. Spreading from the West they got as far as Greenland and made contact (freindly? -unfreindly?) with the Vikings. At the same time I recall a programme about the Greenland Viking community and how their fortunes could be tracked using a variety of archeological and forensic techniques including the type of flies found. All things being equal cross referencing a variety of evidence types can create a useful picture, but the quality of that picture will only ever be as good as the person looking at it. “Higher temperatures might expand arable land – but only if accompanied by increased rainfall. Warmth however, might bring drier conditions”. “Lower temperatures could produce a climate generally wetter and less stable, one marked by storms, floods, and freezes”. In the same article are pictures of the Hintereisferner Glacier (Austria) taken over a period of time ending in 1956 where the glacier has receded a mile from it’s furthest advance and is further back than it is today. the southern part of Baffin Island” (Capitals mine). We’re talking about a regional warm period, not a global one. The results “compare well” with past studies, so it’s not offering new conclusions. Methane has been shown to rise with rising wetland temperature. the graph doesn’t need to be rescaled, there is no comparable methane release 800 years ago to the natural release of today. All I am proposing is that one would expect wetlands to release similar amounts of methane during the ‘mwp’ to similar amounts as todays wetlands do, if the temperature was as warm as now. Your link talks about Methane release during Glacial periods thus not really applicable to the time period. I’m curious to know why they think the Arctic “should” be doing anything. Do they have a crystal ball telling them what “should” be going on anywhere in the world at any given time? The Arctic should be cooling because of the ongoing “wobble” in the Earth’s tilt that leaves the northern hemisphere about 0.6 million miles farther from the sun in summer and shrinks the intensity of the sunlight that strikes the Arctic. Based on changes in solar irradiance, ozone, volcanic eruptions, and sulfates, you’d expect a slight cooling. The only explanation for the rising temperatures we see is the massive increase in GHGs. 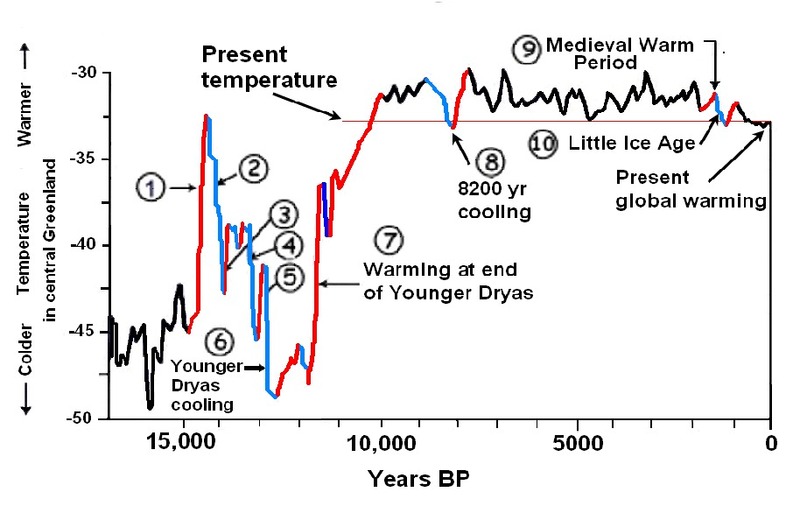 2,000 Years.” In it, on P15, they show a rise in temperatures to the Mediaeval Warm period, followed by a trough and then a new rise that we are in. The repeat this sort of thing with models later on in the document. So, in the absence of the CO2 increase, there was a rise in temperature, and then there is another rise following the industrial revolution and accelerating past 1950. The problem here is that climate reconstructions to test models and to predict future changes are calibrated against conditions during this rise, which may just be part of a natural wave. Okay, then, the AGW-faithful might say “but this rise is faster than the last one” and “this is because of CO2.” This is possible and could be tested by comparing conditions against reconstructions for the previous period, right? Apparently not! 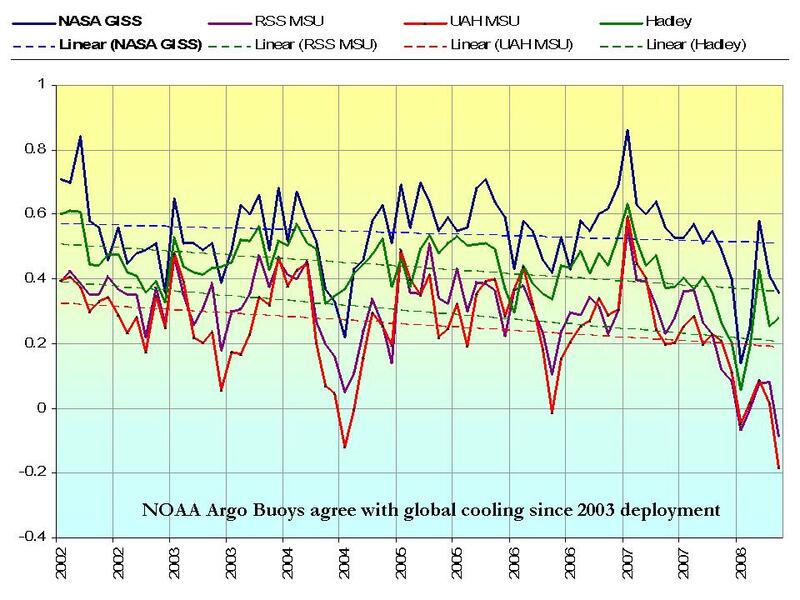 According to the National Research Council, and I quote (See P17), “Very little confidence can be assigned to statements concerning the hemispheric mean or global mean surface temperature prior to about A.D. 900 because of sparse data coverage and because the uncertainties associated with proxy data and the methods used to analyze and combine them are larger than during more recent time periods.” Okay, so let me get this straight. We have a clear wave pattern here, with a second one that may well be part of some natural warming process, and we have no real way to determine whether the current one is steeper than the last. All we know is that it was warmer before than it is today, followed by a cold period, followed by another warm-up. Models are calibrated against dodgy CO2 relationships that we all know are at least 70% temperature driven (considering that CH4 goes in phase with CO2), though there is tremendous uncertainty on this. So, we are freaking out about the most important molecule for plant life, which increases growth and water-use efficiency over what? … Totally uncertain relationships between CO2 and temperature, calibrated in flawed ways against and with no other warming period for comparison (but fed into otherwise fantastic GCM models). Meanwhile, other environmental concerns (land-use change, water pollution etc.) sit on the sidelines because of the AGW religion. The only explanation? That’s just a version of “the science is settled.” And just as wrong. Global temperatures are not rising, they have been flat to declining for most of the past decade: click. Misrepresenting the situation doesn’t promote credibility. And please don’t quote Wikipedia on anything climate related. They are incredible, and using Wiki as a reference just looks uneducated. You might as well use realclimate, or movie star opinions from People magazine. That model overlay on temps is completely bogus. Please don’t insult our intelligence here with inventions. As has been explained many times here, the climate naturally fluctuates above and below its long term trend line. The current climate is no different, and is in fact quite benign by historical standards. Nothing unusual is happening. Nothing. If an increase in CO2 caused any measurable global warming, then the planet would be warming, not cooling. I see your point. You have convinced me thoroughly. Out of the EXTREMELY limited number of factors included in that graph, the only outlier in recent times is greenhouse gases. Therefore, it is undeniable proof. Makes perfect sense. One quick follow up question though: The previous warming period on that graph between roughly 1910 and 1940 was due to what? It looks to be of slightly greater magnitude and duration than the current warming period. If the ONLY explanation for the current is increased greenhouse gases, then there is a lot of explaining to do about what caused the previous warming and why that cause in no way could be similarly resposnible for the current period. By the way, I would love to see an updated version of that graph with current observed temperatures along with the models projections of where we should be. The midge study by Verneaux et al 2009 basically rejected the 20th century part due to fish stocking of the Lake Anterne in the northern French Alps where the study was done. The Yarrow Axford study from Colorado by contrast placed complete faith in their midge proxy up to the present. It is just a speculation, but could the same counfounding factor – fish – have affected the Axford study also? It is not at all uncommon for fish to be introduced to new bodies of water by birds carrying fish eggs on their feet or feathers. Perhaps something connected with the growth of human habitation and towns and industries in the vicinity, altered bird and or fish distributions in such a way as to cause a bird-vectored fish stocking event. Anyone for a spot of Baffin Island fishing? It is strange that the AGW camp put such weight on a single proxy study that shows the party line hockey stick, and have no trouble ignoring or suppressing the large volume of previous published data that do not. For instance the study by Loehle 2007, cited by Roy Spencer, averaged 18 previous proxy studies, and the resultant line clearly demonstratede the MWP and LIA. When I worked in a treeplanting squad trees in Scotland in the Eighties we were often ‘midged’ off the hill. By that I mean that the midges were so bad that we couldn’t work and had to retire to the nearest hostelry. I postulate that hot humid spring weather in the northern hemisphere has a direct correlation to a reduction in new seedling growth and a concomitant increase in man made CO2 emmisions due to the increased uptake of carbonated alcoholic beverages. Pleae, Sir, can I get a humungous grant to resume my studies into man made global warming… sorry… climate change? Ah that would be the midge given to the State. It doesn’t take a scientist to spot illogic. So we discuss scientific articles with real data and the rebuttal is Wiki and IPCC fantasy graphs. At least update them to show the 21st century! Velichko, A.A., Buyce, M.R., Adovasio, J.M. and Cooke, G.A., 1994, “Geology and Geomorphology at the Upper Paleolithic Site of Mezhirich: Macro- and Micro- Perspectives. I’ll have to move that from the Archaeology list on my Biblio to the “Climate Science” column. How many scientific pubs. or papers do I have to have before I can call myself a climate scientist? While I ponder this, I will read the MacDonald et. al article with interest. With 5 of 8 authors being Russian, you never know what you will get. It’s interesting that we KNOW there is a medieval warm period and we KNOW there is a little ice age by looking at proxies. But there is not one proxy that can be beleived which shows a 20th century warming. And of course measured temperatures are all wrong and not to be trusted. As I’ve pointed out on WUWT several times, the study is terribly flawed, because they haven’t considered other possible factors, such as DDT and other pesticides being transported into the lake from nearby military outposts and settlements, plus the tendency for transport or organotoxins into glacial ice which ends up in meltwater lakes. But why would the insecticides mentioned preferentially kill the cold adapted midges? Perhaps because the non-cold adapted midges (insects) were killed by the cold before the DDT could get to them. There’s a lot of evidence of medieval warming in the UK too, the most extreme being the farming of saffron, a crop you won’t find anywhere colder than spain. Interestingly, the same “it was only regional” rebuttal tends to get thrown around a lot. I wonder how many other sites around the world experienced this same ‘regional’ warming. At the same time in history…. ?